It is my own fault of course. I could have been smitten with modern machines sporting fuel injection and even more modern techniques where the molecules of fuel are individually measured into a perfect chamber in a perfect mixture with air to form a perfect explosion. i hear that there is a system in develop that will just scare gasoline into energy directly taking all of the moving parts out of the equation. The drawback is that it causes fuel delivery trucks to vanish into a black hole outside the milky way. But I digress. The new fuel systems are incredibly more efficient and effective, but I am enamored of machines with these things called carburetors. "Hey Gasser, wanna get together? I know a cool roller coaster ride we could try"
"I'm always up for a ride with you Ariel. Let's go." "Cool, we can meet Sparky afterward, he's a blast." The trouble with carburetors is that they are relatively imprecise. They slurp fuel and gulp air. In fact, part of the appeal of the carburetor is that you can hear it slurping and gulping. It is a glorious sound, particularly if you have open bellmouths on Webers. The more you open the throttle, the more menacing the sound, as butterfly valves open and a more voracious appetite is unleashed. But I digress. The BMW /2 (slash two) series of motorcycles generally do not have open bellmouth carburetors, or a menacing growl from the intake. But they do have carburetors. Bing Carburetors. Bing does not sound like a menacing beast, but it can be just that. 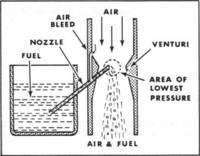 The Bings on the /2 are slide carburetors, which use a combination of fuel at the right level in a chamber, and air utilizing the venturi effect to create the right mixture. In order to perform this magic trick, they use jets. Jets come in all shapes and sizes, but the best example is the needle valve that you use to pump up a basketball or soccer ball. It is hollow, and allows a gas or liquid to pass through it in a controlled fashion. Bings, like other carburetors, have a variety of jets in them to handle idling speed, air, fuel, etc. On the one hand, it is amazing that these devices still work at all 50 years later. On the other hand, small passages in jets are susceptible to even the smallest debris or chemical buildup. People muck about with them to get better performance or to fix other problems. Most old /2s pulled out of a barn will run with the jets out of kilter, but not well. Which brings me to how I spent two entire days getting two /2s to run right. The R50 did not idle well, while the R60 did not like the throttle open more than about halfway. I suspected carbs needed a good cleaning. I took them apart, and removed the floats and jets. The floats looked new. I left the jets to soak in a chemical bath, and made myself a rum and coke...or perhaps I have that reversed. Next day, I blew everything out with the compressor, and declared them ready for service. Installed back in the bikes, the R50 now had a steady idle. I used the Twinmaster to check the balance of the carbs and all seemed well. I took it for a ride and it seemed to be the soothest that I had ever known it to be, but that could be more in my head that in the bike. I returned victorious.